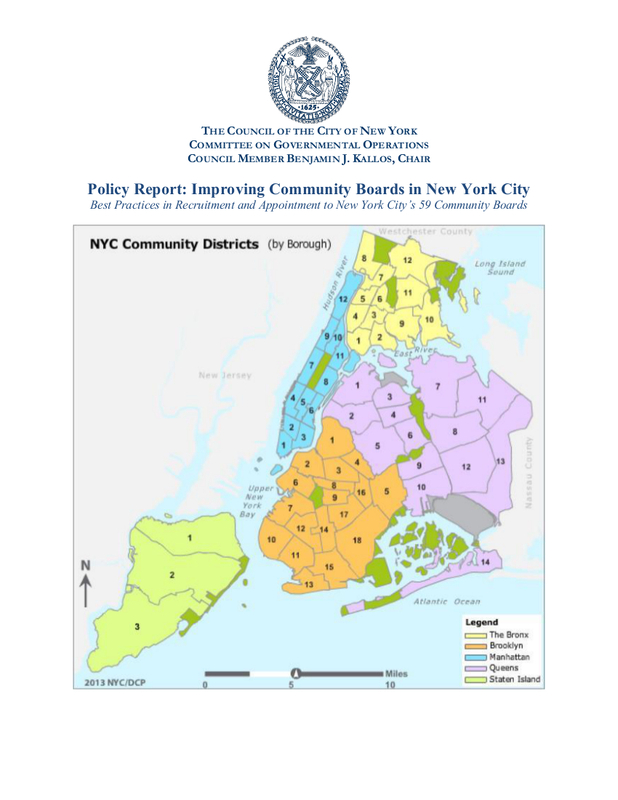 Community boards, comprised of fifty volunteer members, serve for staggered two-year terms. Joining your local board is an eye-opening civics lesson and a great way to get involved in the community. Providing input to city agencies. The best way to learn more is to start ending your Community Board's full board meetings. If you are interested in applying you should consider also attending a subject matter committee meeting in order to become a public member of that committee. As Chair of the Governmental Operations Committee I am tasked with oversight of Community Boards and have produced a report on best practices for recruitment and appointment to the local boards. The report calls for a process that takes into account attendance, expertise and diversity. If you choose to apply online, please let me know that you have done so.